Rhino's GPD-40 Fence Pro is a triumph of engineering. 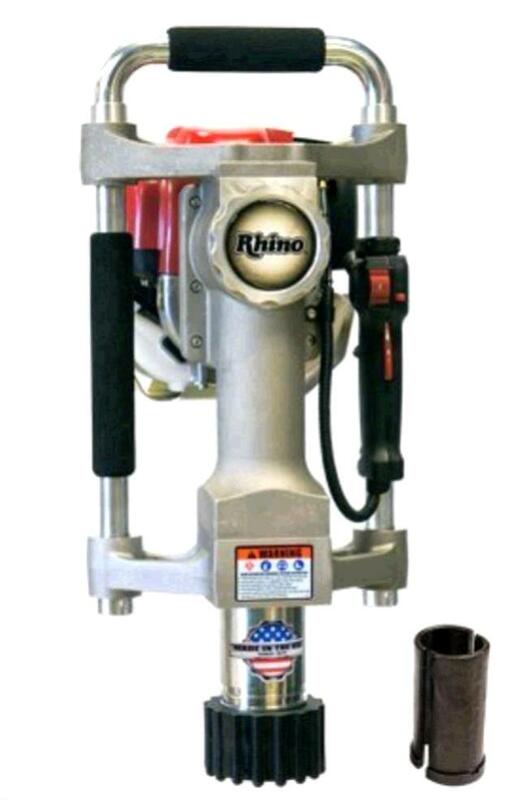 Integrated with the 2-1 2" chuck is the innovative Chuck-Lok technology, which increases the tool's effeciency by allowing for fast chuck changes in the field and ensuring proper positioning for optimal driving power. The Fence Pro's default adaptor is 2", but can be equipped with optional 1-3 4" or2" adaptors. If you are trying to maximize your time and money in the field, the Fence Pro is an exceptional choice. It is typically used for erosion control, agriculture, livestock management, sign installation, rental tent installtion, and more. Its portability and flexibility make it a favorite among professional fence contractors. Works with: T-Post, Ground Rod, Form Pin, Round posts up to 2-3 8" dia., and Tent Stakes.